Changes to the Greenland and Antarctic ice sheet over recent decades have contributed to sea-level rise at an accelerating rate and present the largest potential for future changes in sea-level. Accurate sea-level projections require simulations of ice sheet evolution using next-generation ice sheet models coupled to Earth-System Models (ESMs), but current limitations prohibit such projections. 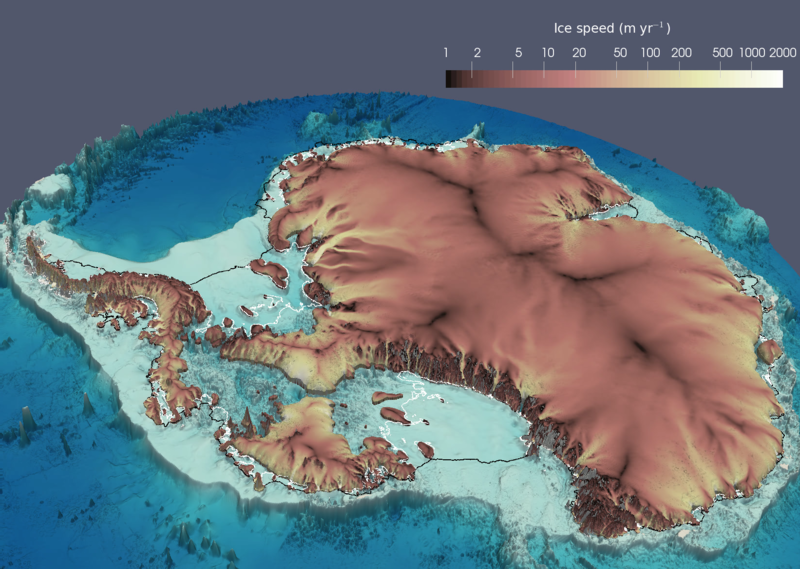 The U.S. Department of Energy (DOE) has invested in the development of advanced ice sheet models (BISICLES and MALI) that place increased resolution in regions experiencing the largest and most rapid changes. Building from these investments, the multi-institutional ProSPect project aims to remove current deficiencies in order to allow for probabilistic projections of sea-level change using DOE ice sheet models coupled to the new Energy Exascale Earth System Model (E3SM). ProSPect was launched in 2017 under DOE’s Scientific Discovery through Advanced Computing (SciDAC) program, a partnership between DOE’s Advanced Scientific Computing Research (ASCR) and Biological and Environmental Research (BER) Offices. ProSPect has three major foci: ice-sheet model physics and coupling, initialization and uncertainty analysis, and ice-sheet model performance on next-generation, high-performance computing (HPC) architectures. 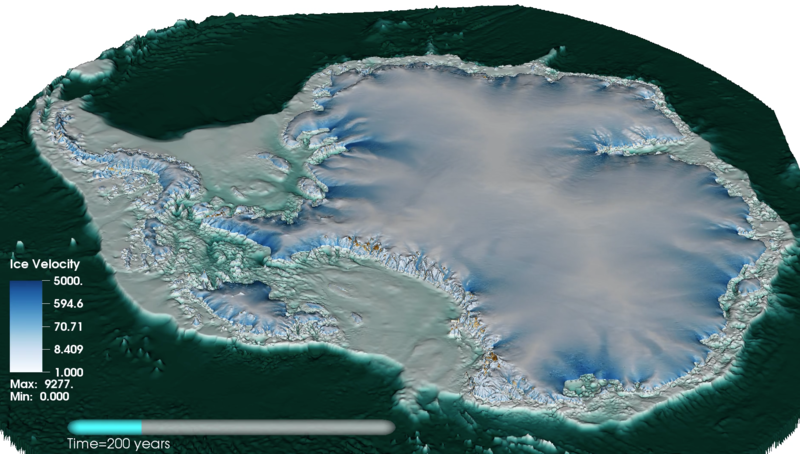 Antarctic ice sheet geometry and surface speed (color) 200 yrs after removal of all floating ice shelves (ABUMIP experiment) simulated by MALI (above) and BISICLES (below). 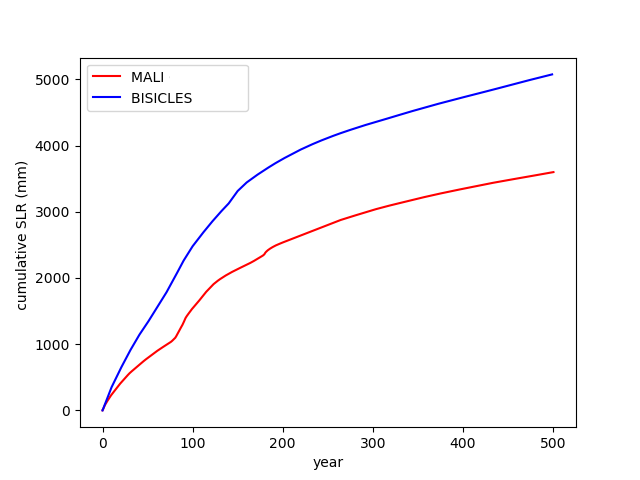 Above: Cumulative eustatic sea-level equivalent (mm) from MALI (red) and BISICLES (blue) over 500 years, following the removal of all floating ice shelves (ABUMIP experiment).